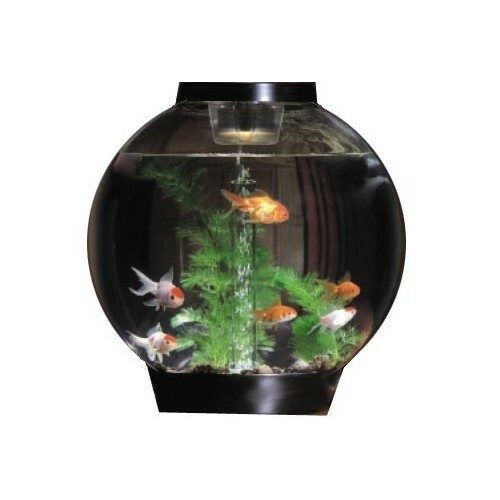 The biOrb combines the looks of a traditional fishbowl with the performance of a hi-tech aquarium. With the filter barely visible in the bottom of the globe, once the biOrb is filled with water there is nothing to detract from its perfect 360 degree viewing angle. 17" Tall X 15" Wide. ACRYLIC TANK: The 8 gallon acrylic globe is clearer and ten times stronger than glass. FILTRATION: Five stages of filtration keep the water crystal clear and free of pollutants. The filter design uses a unique systemized five-stage method combining biological, mechanical and chemical filtration. This significantly reduces maintenance while ensuring that the water remains healthy and crystal clear for months between the simple filter cartridge changes. Includes cartridge filter pad and holder, ceramic filter media, Stress Coat with healing power of Aloe Vera for removing chlorine and Stress Zyme for biological filtration. FOOD: Sample size packet of Hikari Staple pelletized fish food. Can be upgraded to the LED Light Kit which simulates a natural light cycle in your aquarium. Aquarium air pump (2.7 watt). High quality instructional manual. A single transformer supplies 12 volt power to both the air pump and light. For both tropical and coldwater fish. Compatible tropical fish include Dwarf Guarami, Harlequin Rasbora, Cardinal Tetra, Leopard Danio and Amano Shrimp. Compatible cold water fish include Goldfish and Minnows. Easy to maintain, perfect for novices & hobbyists. NOTE: Fish and plants not included.